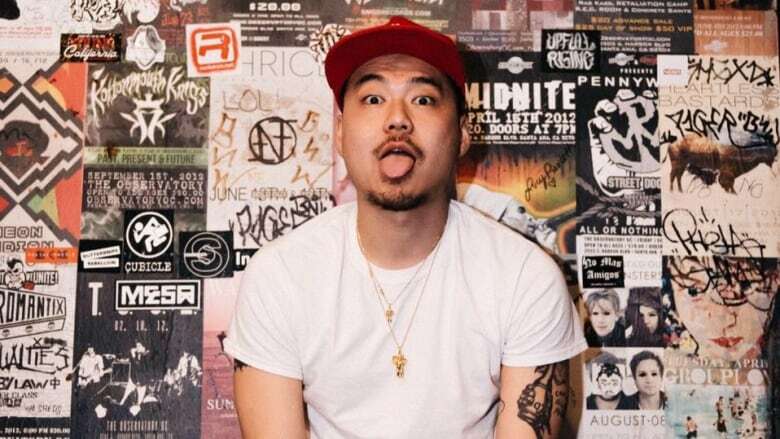 Jonathan Park, who goes by the stage name, Dumbfoundead, starts his tour in Vancouver tonight at Fortune Sound Club. He joined CBC's On the Coast to talk about the media representation of Asian-Americans. Jonathan Park, who goes by the stage name, Dumbfoundead, isn't afraid to get political. In one of his latest songs, "Rocket Man," Park samples U.S. President Donald Trump's quotes about North Korean leader Kim Jong-un. It's also the name of his newest album, which explores his family's journey from Korea to Los Angeles. Park got his start in L.A.'s rap battle scene, where he often faced insults about his Korean heritage. The rapper quickly became known for his witty comebacks and laid-back style. Park starts his tour in Vancouver Monday night at Fortune Sound Club. He joined Gloria Macarenko on CBC's On the Coast to discuss Asian-American representation in the media and the surreal situation of Donald Trump and Kim Jong-Un engaging in diplomatic talks. Let's start with your family's journey from Korea to Los Angeles. My parents are both full Korean. At the time, there was a huge immigration of Koreans coming into South America. From there, we made the journey up to Los Angeles through the Mexican border. My sister and I were babies. Your music video for the song "Safe" features your face superimposed on famous lead roles in Hollywood movies. What were you trying to say with that? There's been a huge discussion around white washing in Hollywood and I wanted to flip it and Asian-wash the Hollywood lead roles. Representation is important for kids who grow up watching TV and movies. I remember watching those heroes and wondering how come nobody looks like me on TV. As I got older, I had a better understanding of what was going on. The system needs to be more open to using people of colour in movies and TV. It's also not just about the actors only being on TV. It's about the writers and the people telling their stories behind the scenes. You've made a name for yourself in America, but you've also released music in Korea. What's the challenge of navigating a hip-hop career in two languages in two very different countries? It's definitely tough. It's not about just the fact that I'm Korean, and I'm able to make music in Korea. I don't identify myself necessarily as Korean. I identify myself as Korean-American, which is a completely different story for any Asian-American. President Donald Trump has said he's going to engage in talks with Kimg Jong-un. You released a song called "Rocket Man," which samples Trump's own quotes about the North Korean leader. Is all this surreal to you? It is surreal. North Korea is still Korea. When I turn on the TV, I still see someone who's Korean and someone who comes from my ethnic background. It's very surreal seeing Korea being mentioned every time I turn on the TV. That represents the name of my tour, "Yikes." That's my initial reaction when I turn on the TV. With the rise of hip-hop Asian acts, such as Higher Brothers and Rich Brian, do you think the perception of Asians and Asian-Americans is changing in the media? There's more acceptance of hearing raps in different languages. But there could definitely be a lot more stories shared by Asian-Americans. This interview has been edited and clarified.